무위사는 전라남도 강진의 월출산 동남쪽에 있는 사찰이다. 신라의 명승 원효(元曉)가 창건하여 ‘관음사’라 하였고, 명종 5년(1550) 태감(太甘)이 4번째로 세우면서 무위사라 하였다. 이 탑비는 선각대사 형미(逈微)를 기리기 위해 세운 것으로, 고려 정종 원년(946)에 건립되었다. 선각대사는 신라 말의 명승으로, 당나라에 건너가서 14년만에 돌아와 무위사에 8년간 머물렀다. 고려 태조 원년(918)에 54세의 나이로 입적하자 고려 태조가 ‘선각’이라는 시호를 내리고, 탑이름을 ‘편광영탑’이라 하였다. 이 비는 대사가 입적한 지 28년만에 세워진 것이다. 비는 비받침과 비몸돌, 머릿돌을 모두 갖춘 완전한 모습이다. 비받침은 몸은 거북이나, 머리는 여의주를 물고 있는 용의 형상으로 사나워 보이며 사실성이 뚜렷하다. 중앙에 마련되어 비를 직접 받치고 있는 비좌(碑座)에는 구름무늬와 둥근형태의 조각을 새겼다. 비몸에는 선각대사에 관한 기록과, 최언위가 비문을 짓고 유훈율이 해서로 썼다는 기록이 있다. 머릿돌은 밑면에 연꽃무늬를 새긴 3단의 받침이 있다. 중앙에는 비의 이름을 새겼던 네모진 공간이 있으나 마멸되어 글씨를 알아볼 수 없고, 그 주위로 구름속 용의 모습을 조각하였는데 이는 죽은 사람의 영혼이 천상세계로 가기를 기원하는 의미이다. 각 부의 조각수법이 같은 시대의 다른 석비에 비해 사실적이며, 조각예술로서의 우수성을 나타내고 있다. 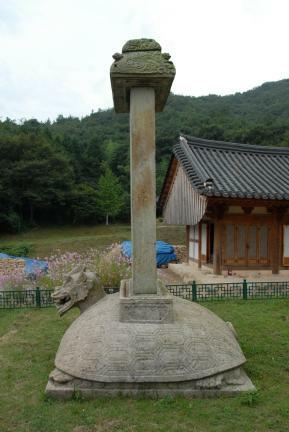 This stele was built at Muwisa Temple to commemorate the life and achievements of the Buddhist Monk Seongak in 946, the first year of the reign of King Jeongjong of the Goryeo Dynasty. The temple is located on the southeast side of Wolchulsan Mountain in Gangjin, Jeollanam-do. 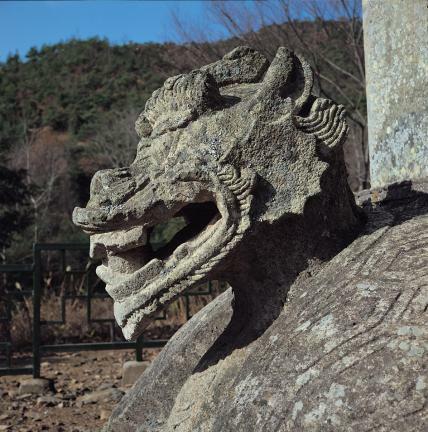 It was originally called Gwaneumsa Temple, and was founded by Wonhyo, one of the greatest monk in Korea. 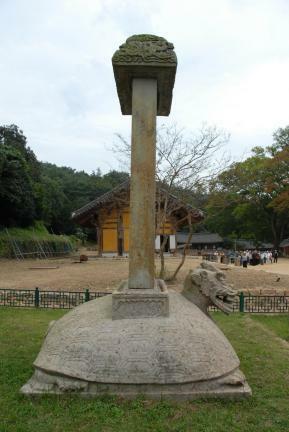 The temple was renamed Muwisa when it was re-erected, for the fourth time, by Taegam in 1550, the fifth year of the reign of King Myeongjong of the Joseon Dynasty. 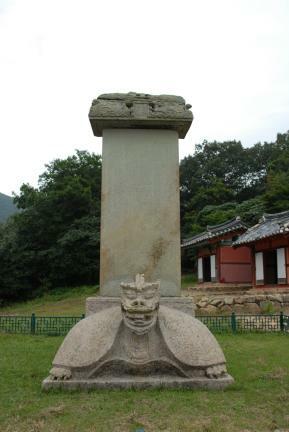 Monk Seongak, one of the most eminent Buddhist monks of the late Silla period, spent eight years at Muwisa after 14 years of study in Tang Dynasty China. 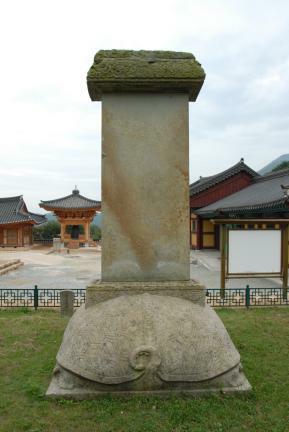 When he entered Nirvana at the age of 54 in 918, the first year of the reign of King Taejo of the Goryeo Dynasty, the king granted him the posthumous title Seongak, and named the pagoda 'Pyeongwangyeongtap Pagoda'. 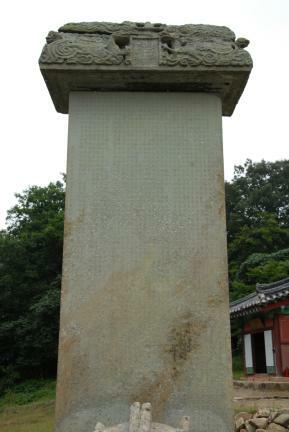 This stele was erected 28 years after Seongak's death. 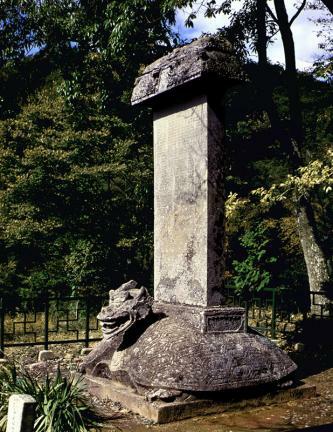 The stele is preserved very well, and consists of a pedestal, a main body, and a capstone. 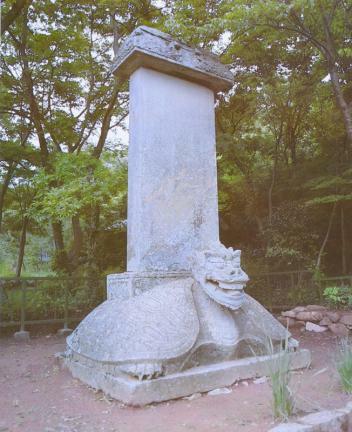 The turtle-shaped pedestal has a dragon head, looking very vivid and fierce and holding a magic bead in its mouth. 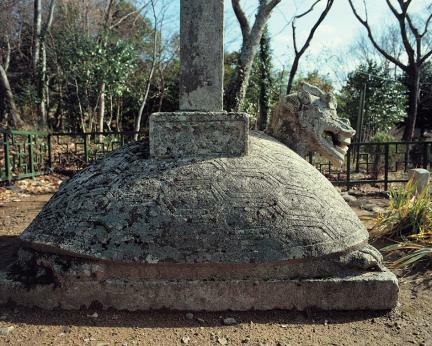 A supporting stone that holds up the main body of the stele, placed on the center of the pedestal, is engraved with cloud and circular patterns. 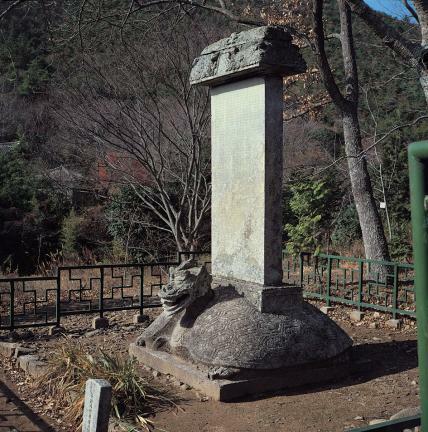 The main body carries an inscription about Seongak that was composed by Choe Eon-wi and inscribed by Yu Hun-yul in the square style of Chinese handwriting. The capstone has a three-tiered cornice engraved with lotus flower patterns. At the center of the capstone is a square space on which used to be written the name of the stele, but it is too defaced now to be recognizable. 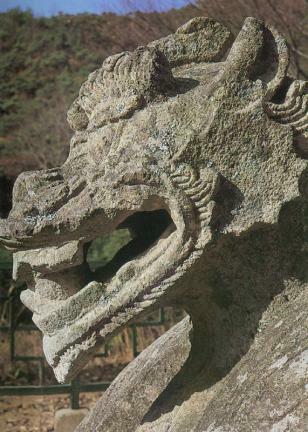 The capstone is carved with dragons in clouds, intended to lead the spirit of the dead to heaven. 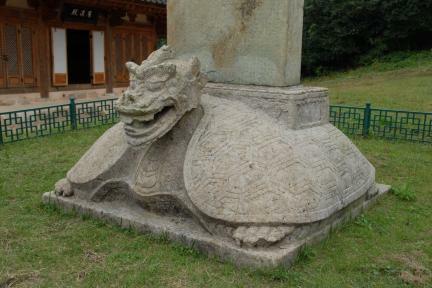 The stele is constructed with excellent workmanship, and shows a realistic and vivid sculpturing style compared to other steles.